"I'm not an organizer by nature," says Michelle, actress and busy Mom of three, almost immediately. 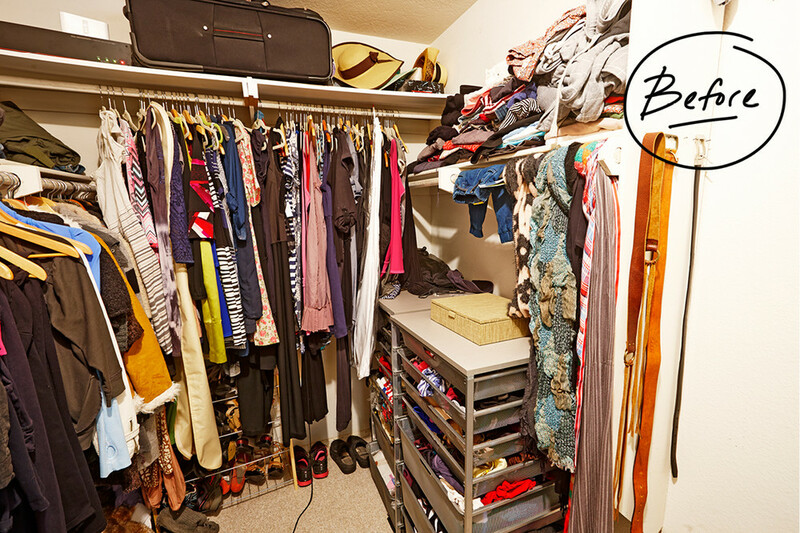 "When I moved in, the closet was so poorly organized and wasted so much space, I really had no idea where to start," she continued. Where to start? What to fix? How to fix it? These are questions meant for The Container Store. And once Michelle gave us a call, we went to work to make her closet perfectly customized to both her acting, and mom, life. Though elfa was in-use in the closet before our makeover, it wasn't being utilized to its fullest potential. Now, Michelle can survey almost everything in her closet at a glance - making wardrobe changes and kid drop-offs so much faster than it used to be. "When we started designing, I knew that there were a few key areas I wanted to maximize in my closet," Michelle says. That meant a place for laundry, more hanging space, LOTS of room for shoes, areas to organize jewelry and more open space to get dressed. With those thoughts in mind, our team of designers and installers went to work. 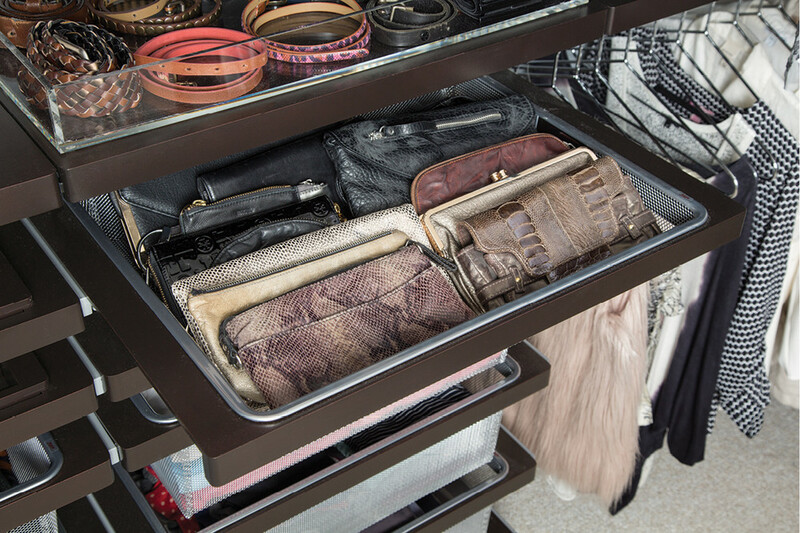 Now, bins have a purpose yet still look beautiful as an accent to the closet, all of Michelle's casual clothing can be stored within our elfa Gliding Mesh Drawers, hanging clothing has ample space and shoes have a place to shine. "With my auditions, I have a lot of clothes that I purchase but don't often wear. I have to buy by category whether I'm being called to read for a mother, a sister, a friend or other. So there's a ton of clothing that I don't need from day to day. I wanted to keep those pieces separate from my clothing that I do often wear," says Michelle. Now Michelle can dedicate areas of her closet to those "role-specific" outfits and still keep her day-to-day clothing front and center for when she needs to run errands or pick up the kids from school. Our Maize Storage Bins are an ideal open storage option to organize Michelle's jeans and other more casual clothing items. They're easy to take down from the elfa décor Shelf and they work perfectly to frame the space. Our Chrome Hangers serve as a beautiful contrast to the dark walnut within the space, and their ability to securely hang heavier garments can't be beat. Shoes! What could be more important than shoes? 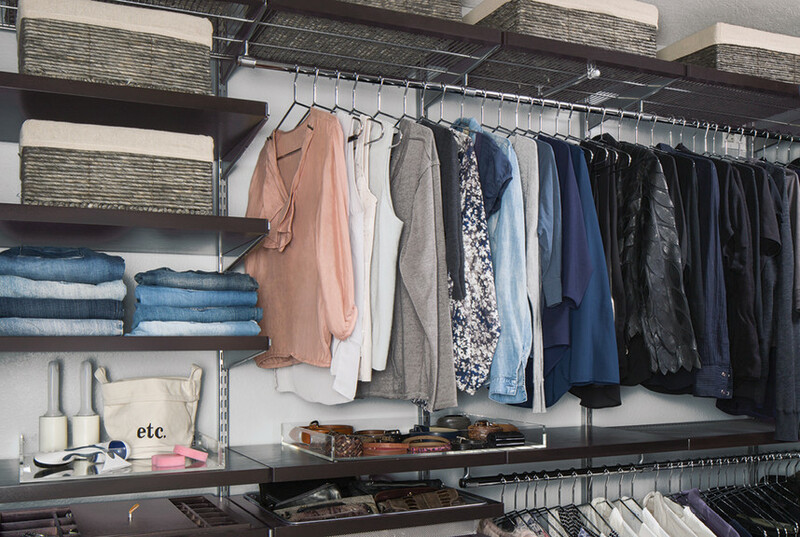 Our elfa Angled Solid Metal Shelves with décor Fascia match the beautiful walnut color of the rest of the closet and allow Michelle to instantly see her entire collection. Now it's a breeze to choose the right shoe and leave the house a little more on schedule. The raised edge of each angled shelf coordinates with the rest of the closet and allows her shoes to sit at an easily visible angle without sliding off. elfa décor and our elfa Mesh Drawers provide both sophistication and functionality. The most shallow size allows Michelle to store her many clutches and small purses out of sight and in organized fashion. 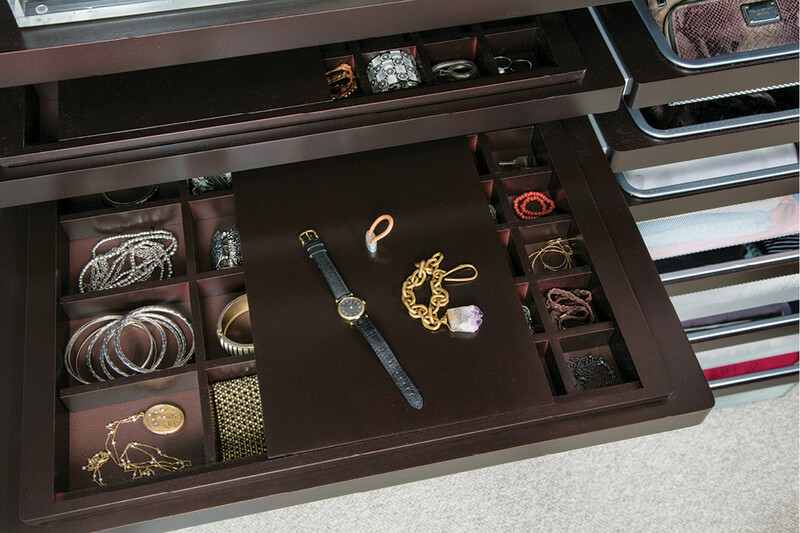 Our elfa Jewelry & Accessory System keeps all of Michelle's bracelets, necklaces, rings, watches and earrings organized and neatly stored so they never get tangled or lost. "You should see my closet now," Michele says almost four months after installation. "When I rushed out the door before, I would usually have every outfit out wherever any surface was available. But now I've actually kept it color-coded so I know where everything is, including my bags and accessories," she continued happily. What's next on Michelle's elfa horizon? "Well, I have a bunch of boy's closets that are disasters," she says with a chuckle. We hope to see you and those closets soon, Michelle!